Osteoporosis is a disease characterized by the thinning and weakening of the bones, and the risk increases with age. It is especially common for women, even more so for those going through menopause. Bone density can rapidly decrease as estrogen levels decrease, as occurs during menopausal years. Osteoporosis can be painful and lead to bone fractures, usually in the hips, spine, and wrists. Luckily, there are several alternative treatments to address this condition, whether its caused by hormonal changes, lifestyle choices, dietary choices, or other things. Calcium is absolutely essential for bone density. If your body is low on calcium, your likelihood of getting osteoporosis increases significantly. To retain calcium in the bones, it's also very important to consume sufficient vitamin D, K, and magnesium, as calcium is not absorbed well without these nutrients.You can find vitamin D in egg yolks, fortified cereals, or in supplemental form. Vitamin K and magnesium are found in dark leafy greens. Calcium can also be found abundantly in dark leafy greens, as well as broccoli, figs, and great northern beans. Research has shown that a high-fat diet can lead to low calcium levels in cancellous bone, which is the spongy part of the bone. In general, those consuming greater amounts of fat have a lower mineral content in their cancellous bones than those eating a low-fat diet. You can avoid this risk by consuming less red meat and high-fat foods, like fried foods, and replacing them with leafy greens and lean proteins, such as tofu and seitan. Too much or too little protein can be a risk factor for osteoporosis. Excess protein can upset calcium balance in the bones, while insufficient protein can lead to bone fractures. Therefore, it is very important that you eat the right amount of protein, whether it comes from soy, quinoa, low-fat dairy, or lean meats. Talk to your doctor to find out what your daily protein intake should be based on your age, body, and personal circumstances. Going straight to one of the root causes of osteoporosis, this herbal remedy has been shown to increase estrogen levels in the body. This is because it contains phytoestrogens, which are received by estrogen receptors and work in a similar way to hormones produced by the body. Black cohosh has been used for many years by Native American tribes for gynecological purposes, especially in relation to menopause, and its been gaining more popularity in recent years. Women have been thrilled by its ability to restore hormone levels. It can be found in tea or supplemental form at nearly every health food store or online herbal retailer. Hormone-regulating supplements are 100% natural supplements that helps alleviate symptoms related to hormonal imbalance in middle-aged women. It has long been used for of its ability to boost energy, increase libido, and restore hormonal balance. Results are usually noticed within just a few weeks. If you are suffering from osteoporosis, these alternative treatments can balance your hormones and protect essential bone density. While early prevention is the best strategy, those already suffering from bone loss should take steps to avoid further damage. It is possible to restore bone density with the right treatments. Should I Avoid Spinach if I Have Osteoporosis? If you're concerned about calcium intake, consider increasing your intake of some of the other calcium-rich foods that help to improve bone density. 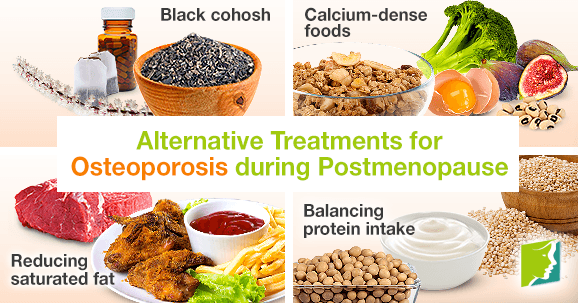 Osteoporosis is a serious medical condition that can be caused by menopause.